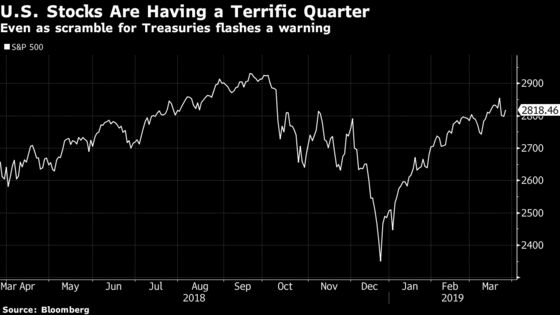 (Bloomberg) -- U.S. stocks and Treasuries have both surged this year, but the recession warning that the yield curve just blared suggests this lockstep relationship may end. Demand for Treasuries has shot up -- pushing yields on 10-year notes to the lowest in 15 months -- as Federal Reserve policy makers fret about the U.S. economy’s growth prospects. At the same time, U.S. stocks are having their best quarter in a decade, suggesting a rosier view. The old textbook view of investing suggests stock and bond markets shouldn’t move in the same direction at the same time, but that ivory-tower perspective isn’t how things always play out in the real world. Nevertheless, the recent nervous buying of Treasuries does indicate trouble ahead, suggesting a headwind for stocks is coming. In 2019, the S&P 500 Index has advanced 12 percent, just days away from its best quarter since 2009. At the same time, 10-year Treasuries have surged, pushing yields down 30 basis points since Dec. 31 to 2.39 percent early Wednesday morning. Ultimately, markets are going to have to readjust and that could mean a repeat of December’s stock-market rout, said Scott Kimball, of BMO Global Asset Management’s Taplin, Canida & Habacht, which manages $12 billion from Miami.